Investors pulled a record amount out of emerging market equity funds last week. 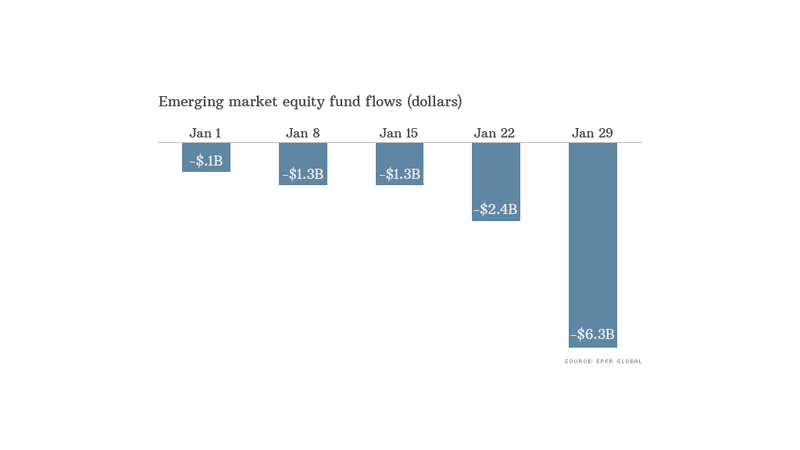 Investors yanked more than $6.3 billion from emerging market equity funds last week, the largest outflow on record in dollar terms. Boston-based fund tracker EPFR Global said the outflow was broad based and the biggest in three years as a percentage of assets under management. Institutional investors accounted for $5 billion of the redemptions. Emerging markets have been hit this year by a perfect storm of rising interest rates in the U.S., fears of a slowdown in China, political turmoil, and concerns that emerging market economies haven't reformed fast enough to make growth sustainable. The sell-off has gathered pace since Argentina gave up trying to defend the value of its currency last month. Central banks in India, Turkey and South Africa were forced to jack up interest rates last week to try to halt the exodus. Together with Indonesia and Brazil, those three countries make up the so-called Fragile Five. The five countries depend on foreign investment to finance imports, and all are set to hold elections this year, promising months of political uncertainty and little impetus for reform. "The macro fundamentals of the Fragile Five have been publicized for some time, so it seems likely that political risk has helped drive some of the moves," wrote Craig Botham, emerging markets economist at Schroders. Protests in Thailand and Ukraine have also served as a powerful reminder of the risks emerging market investors face. "The absence of an obvious way forward (in Thailand) will further undermine confidence in an already struggling economy," noted Capital Economics on Monday after protesters disrupted weekend elections. "Foreign investors have been pulling funds out of Thai equities since November." Still, despite the broad retreat, a few markets have managed to buck the trend, EPFR said. China equity funds attracted $363 million as local currency inflows offset the loss of euro and dollar-denominated investments. Turkey's dramatic midnight move last week to raise rates by 4.75% appeared to have paid off in the short term, with equity funds taking in fresh money for a sixth straight week. But the general flight from riskier markets was also reflected in emerging market bond funds, with redemptions hitting an eight-month high last week, EPFR said.